1478 600/30k Very high level input. 1:5.9. Replaces 7456. 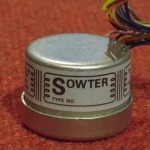 High level, very high performance input transformer. Mumetal can with M3 threaded mounting holes and colour coded leads, threaded grommet or PCB pins. 10k/10k+10k (10K/40KCT) input transformer with two identical outputs for driving a balanced (push-pull) amplifier. Two chamber bobbin ensures 100% amplitude and phase balance over the full bandwidth. Replacement transformer for Triad HS-29 with improved performance. Zobel network not normally required. May be used in reverse for stereo to mono combination. Ideal for the interstage transformer on the Pultec EPQ-1A giving improved performance relative to Sowter type 9330. 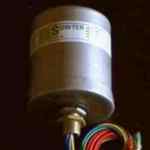 May be used as a high impedance spliter or combiner. Ideal for combining two stereo signals to feed a mono amplifier. Max level +31 dBu Mumetal can. Needs a small modification to fit Drip chassis. Please ask for details. Package style Threaded grommet style "E"2 x M3 mounting holes style "I"
8540 600/10kCT 1:4 Mic/Line input/output transformer. May be used for 1:4 voltage gain for a mic/line input or used in reverse for matching a CD player or sound card to a 600 ohm line. Total dc resistance 112 ohms ref primary. High performance input or low power output tube, IC or transistor amplifier. Must be ac coupled when used for output. CT output for phase splitting etc. Mumetal can. +16 dBu on 600 ohm side. Suitable for Federal AM 846. Similar to 1460 but with 2 separate primary windings. May be configured as 600 or 2400 Ohms primary.. Input level +24 dBu at 50 Hz. . Combination Mumetal Radiometal core. THD 0.01 % at 1KHz. High level, very high performance line input transformer. Two chamber bobbin ensures 100% accurate phase splitting over full bandwidth. Suitable for Gates STA level compressor. Mumetal can with threaded grommet and colour coded leads. High level, very high performance line input transformer. Two chamber bobbin ensures 100% accurate phase splitting over full bandwidth. Mumetal can with threaded grommet and colour coded leads.